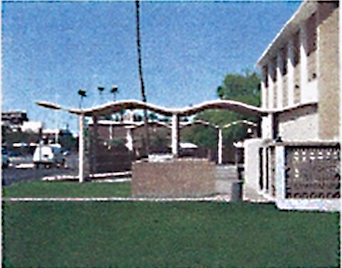 MPF involvement: lead the effort for the successful designation of the City of Mesa Library as a historic landmark. This building maintains all of its original features including a floating terrazzo stairway in its lobby, original light fixtures, and the “wave” formed-concrete covered walkways to the rear entrances, possibly inspired by the Brazilian architect Oscar Niemeyer, the pioneer in using reinforced concrete in Brasilia during the early 1950s. Horlbeck & Hickman were designing buildings at Arizona State University and throughout the Valley utilizing concrete forms in many different shapes. The 1950s brought a new bright future for the country, when materials not available until after WWII permitted architects to experiment with different forms and elements. The north and south glass facades were set back from the exterior wall of decorative masonry and clay tile solar screens to provide protection from the harsh Arizona sun. While the term “sustainable design” was not used then, many architects were interested in energy conservation in design even in the 1950s and were applying those design features in their buildings.